It is never wise to ignore market, economic or voter sentiment. Discount it, yes. Put it into broader context, for sure. But ignore it at your peril. As too many retailers, fund managers and politicians have discovered, the public is often a good barometer of what is occurring in the broader economy. But not always: the public can be fickle. People are subject to all manner of cognitive biases that affect their objectivity and thought processes. There are times when sentiment is very much at odds with economic data. That has been the anomaly for much of the past seven years or so. It demands an explanation. Four recent articles had me thinking about this over the weekend. Running through all of these was the curious thread of negativity at odds with other, more constructive data. This has been fairly common since the financial crisis. At risk of channeling the sort of “mental recession” error made by former U.S. Senator Phil Gramm, let’s explore how and why that might be, via these four items. You have to wonder. Are these hedge funds, traders and others in finance already bearish, and seeking out views that agree with their investment outlook? If so, that is a classic case of confirmation bias. Perhaps they are still suffering from the trauma of the 2008-09 crisis? We know from past research that crashes can haunt investors for decades. The recency effect creates a fear of what just happened — especially big traumatic events. No wonder so many investors fear another financial crisis. Maybe that’s at work here. That leads us to the second news item: Warren Buffett calling the fees that hedge funds have been paid for mediocre results “unbelievable.” “There’s been far, far, far more money made by people in Wall Street through salesmanship abilities than through investment abilities,” Buffett said Saturday during Berkshire Hathaway’s annual meeting in Omaha, Nebraska. Have a look at the chart below from Bianco Research of hedge fund returns compared with the Standard & Poor’s 500 Index and the Barclays/Lehman Aggregate Bond Index. The underperformance of hedge funds is stunning — and this is before fees, which would make the returns look even worse. 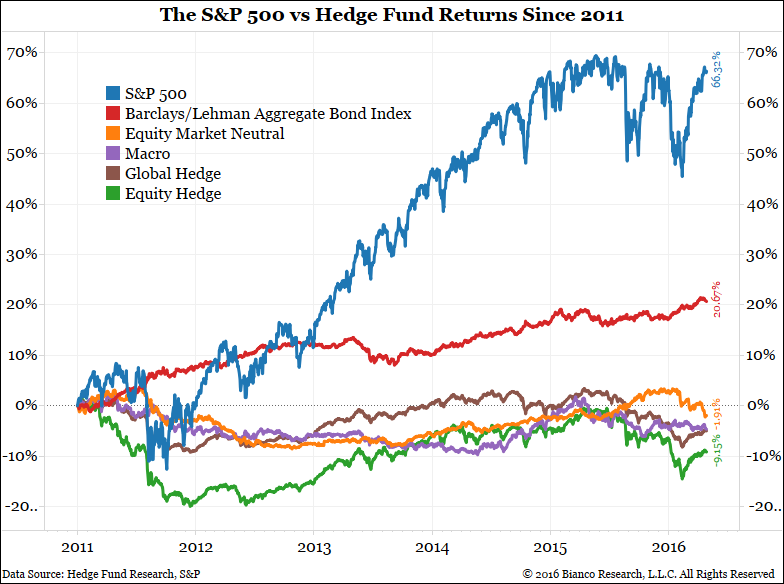 Perhaps it’s more than just an interesting coincidence that the rise of Zero Hedge’s popularity and its radical bearishness coincides with the collapse of hedge fund performance. Zero Hedge and whatever insight one can get from it probably isn’t the cause of that underperformance. However, the Internet has created an environment where interesting, persuasive — and money-losing — commentary is but a single click away. In an earlier era, there were plenty of cranks and quacks. However, you had to actively seek them out; they didn’t show up in the first page of your Google search results. Modern technology has given us easy access to oddball or fringe sentiment. In the era before the Internet, the equivalents of Zero Hedge had a much smaller megaphone. If confirmation bias is driving some hedge-fund managers, perhaps we need to ask what is driving angst among employees. This was the third news item that caught my own confirmation bias over the weekend — a recent report which found U.S. workers were thehappiest they’ve been in a decade. This stands in contrast to the image we commonly get of workplace conditions. Certainly dissatisfaction with the job market has been a critical narrative as thiselection cycle plays out. Many forces are driving this paradox. Despite an improving economy and rising stock market, skepticism abounds. Start with the secular shift in the economy, due to globalization and automation. This has made low- and medium-skilled labor vulnerable, as outsourcing eliminates many jobs in lots of industries. Add to that a middle class that isn’t seeing any appreciable wage gains, and rising income inequality, and you have the recipe for lots of economic anxiety and unhappiness. The fourth item was Robert Shiller’s column in Sunday’s New York Times, in which he noted that the common theme of major global recessions has been “contagious stories of wide significance. Basically, global recessions tend to begin when newly popular narratives reduce individuals’ motivation to spend money. Psychology matters a great deal.” This suggests to me that fringe sentiment — combined with actual economic weakness — could have an impact on economies. What this reveals is that, as I like to say, investors must “curate their personal investment resources”: Learn who is insightful and trustworthy, and identify those whose advice results in losing money. It will save you time, not to mention heartache. October 27, 2017 What Has Been Driving the Bull Rally?